Summary: The ridiculousness of out-of-body scenes that should have been dismissed as Clay’s agitated fantasies ruin an otherwise disturbing, suspenseful thriller. Awake is a truly bizarre film, a brave, high-concept conspiracy thriller that falls short of its ambitions under the weight of its accumulative flaws. With laudable commitment to his story, first time writer/director Joby Harold has compromised nothing bringing this plot-heavy drama to the screen. Yet throughout, you wonder if the script might have benefited from a second opinion, tempering his fidelity to his vision and naivety presenting it. For this admittedly rather squeamish reviewer, Awake managed the curious feat of being, by turns, gripping and literally unwatchable. The intrigue of the plot and the voyeuristic horror of the intimate surgical procedures presented are initially grimly compelling. But the former is undermined by unnecessary daftness, while the latter becomes too gorily overwhelming. According to the opening captions as many as 30,000 of the 21million people put under anaesthesia every year in the US remain awake during operations. Which is a brilliant, terrifying hook. But while making us graphically empathise with them, to the extent of revulsion, the film overplays it as a plot device. Hayden Christensen is Clay Beresford, a 22-year-old Manhattan billionaire and the scion of a real estate dynasty established by his late father. Engaged to the beautiful Samantha (Jessica Alba), Clay keeps their relationship secret from his shrewish mother Lilith (Lena Olin), preferring to confide in his friend Dr Jack Harper (Terence Howard). Jack is the surgeon who saved Clay’s life after a heart attack and it is to him that the young man entrusts the impending transplant operation he needs to save his life, despite his mother’s preference for a brusque, top-flight doctor (Arliss Howard) who has operated on presidents and suffers none of Jack’s debts or malpractice suits. Jack advises Clay to marry Sam, and despite disapproval from his mother, he does so in a hastily arranged ceremony. No sooner are they wed than a call comes through that a donor heart is available. The newlyweds rush to the hospital and Sam makes peace with her mother-in-law as Clay goes under Jack’s knife. 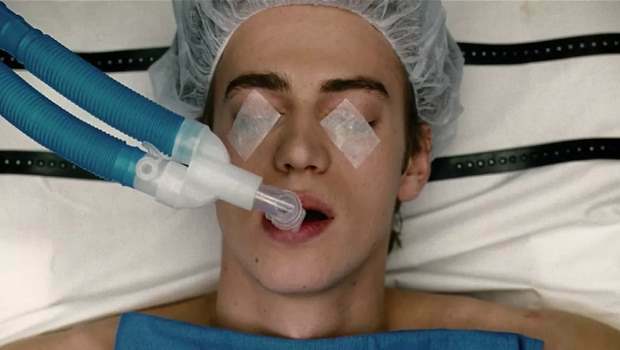 To reveal more would include spoilers, save for noting the arrival of a last-minute replacement for one of Jack’s team, the apparently drunk Dr Larry Lupin (Christopher McDonald) and to acknowledge that Clay does indeed fail to succumb to the anaesthetic, remaining awake throughout the procedure as his chest is sliced open. Christensen conveys the full horror of this waking nightmare, but to keep his star and film together, Harold has Clay’s soul floating off the operating table and roaming the hospital corridors like Patrick Swayze in Ghost, discovering more about those closest to him as he transmigrates. The out-of-body exposition serves its narrative purpose, but Harold gets carried away and eventually the ridiculousness of scenes that should have been dismissed as Clay’s agitated fantasies ruin an otherwise disturbing, suspenseful thriller.